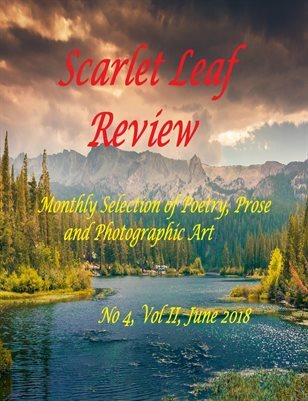 Welcome to Scarlet Leaf Review, Sean Lynch! My name is Sean Lynch, and I'm a poet and editor from New Jersey. I grew up in Camden County then moved to Philly when I was nineteen. I lived in South Philly for a while then moved to Camden a couple years ago, where I went to college at Rutgers. Not on my career no, but in general yes. I first encountered poetry in Catholic grade school where I had a hippy teacher named Mrs. Reagan who encouraged me to write poems influenced by Walt Whitman. Then in high school I had a few different teachers who helped expand my interest in writing in general. However, I was a bit of a troublemaker in school, and even though I took several AP classes, I never studied, and my drug use had an effect on my outlook of the world. I kept writing poetry, although not in an academic setting. I always had an affinity for literature and language, although early on I had problems with grammar and phonetics. That all cleared up by reading intensely just for fun. I think you sort of naturally absorb knowledge on the complex rules of the English language by just reading a whole lot. School can be oppressive and I'm sure Einstein felt constrained by how the teachers were trying to force him how to think. In order to get creative and be truly original you have to break out of the academic box. That's why I don't agree with the MFA culture we live in currently. Poetry is the ultimate goal in my life. If I become well known as a poet, then that will be great. Early on it was Walt Whitman and William Carlos Williams, then when I met my mentor Lamont Steptoe, I became engrossed in the Black Arts Movement: Gwen Brooks, Sonia Sanchez, and Etheridge Knight especially. These poets taught me how to speak the truth and bear witness to issues of social justice. Two of my all time favorite poets, Seamus Heaney and Eavan Boland, I relate to because of my Irish heritage, as well as of course, W.B. Yeats, whom I fell in love with in high school. Some other poets I like in no particular order: CA Conrad, Pablo Neruda, Elizabeth Bishop, Langston Hughes, Carolyn Forche, Robert Creeley, Adrienne Rich, Frank O'Hara, Claude McKay, Emily Dickinson, and Gerard Manley Hopkins. I've published two books of poetry so far, the first called, the city of your mind which was published by Whirlwind Press in 2013. The second is a chapbook called Broad Street Line that was just published by Moonstone Press. Hundreds of my poems are available on my blog as well as dozens of essays and short stories. Two plays that I've written, "Numbers in the Air" and "Vintage" were produced and performed in the 2014 and 2015 Rutgers Camden One Act Play festivals. Right now I'm working on a full length collection of poems tentatively called River Breath. All of the poems in it featured bodies of water as either a thematic backdrop or a mode of symbolism. Q: When did you decide to become a poet? What was the decisive factor, or you just took a pen and starting writing poems? As my mentor says, "poets aren't made, poets are born." Despair, anger, hope, and fear. I used to be a confessional poet who relied on surrealism and symbolism. Now, most of my poems have some sort of narrative and speak to social justice issues. There's nothing easy about it if you're doing it right. All the time. Reading helps out a lot. Read good poets and you'll eventually write good poetry. But don't copy other people's style. And I hate "found poetry." My first book has a cool minimal design with a photograph looking out from inside an abandoned factory in North Philly. My ex-girlfriend who is an artist, Stephanie Gonzalez, took that picture. My college best friend Sean Quinn designed the cover. Melissa Rothman designed the cool cover for my new book, which features some orange geometric designs based off of the Broad Street Line subway. Melissa is the Art Director for the literary journal I co-founded with Lamont Steptoe, Whirlwind Magazine. Actually, in contrast to the cliche, I do think covers are important. The cover sets the tone for the interior content of the book, especially for poetry. Yes, for Broad Street Line I was interviewed by "Philly's Kinda Cool," which is a podcast and radio show on 106.5 fm. It was a lot of fun talking about my poetry process and using Philly as a source for material. I love film and used to be an amateur filmmaker so I think they're a great way to promote your poetry. I think of it kind of like a music video for your poem. I mean it works in as much that you get your books out there, but obviously it's not good for you as a professional, unless there is a means to an end if you catch my drift. Don't destroy your journals. Even if it's not good writing, it would have been useful later. I'd like to drink with Dylan Thomas. Keep writing. Don't stop. And get yourself involved in a community. Preferably one that's not academic.